David Simon, VP, Advertising Solutions, Local Corp.
Video is everywhere you look, from your smartphone to the back of a cab, and at your gas station. National advertisers understand the power of video as a compelling tool for brand recall. “As usual the big kids get to go first,” said David Simon of Local Corp., referring to national brands being ahead of the curve in video advertising. Local Corp. created a platform where anyone can create rich media, which includes video and any one of the following: animation, page interaction, data and dynamic feeds. But if you look at the marketing efforts of a local SMB, you may not find video at all, or if it’s there, it’s under-utilized. Video Local Media Program Director Rick Ducey moderated today’s panel that suggested ways to integrate more video into local marketing campaigns. “The broadcast business is completely local,” said Fisher Communications Senior VP Randa Minkarah. Minkarah presented a KOMO News Network case study to demonstrate how one local television station changed its approach to business by pushing video from television to online via the station website, radio and smartphones. This method provides unduplicated reach, as there are different audiences on each platform. Fisher plans to implement a similar approach to enhance multi-platform sales efforts. But what works for local media may not be as easy for SMBs. 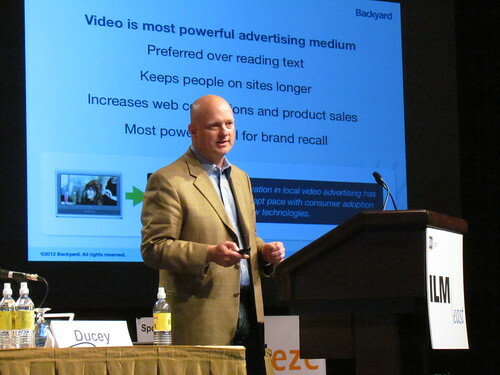 Backyard CEO John McIntyre identified two key problems in getting video out to consumers. “Local video advertising is not keeping the pace with consumer changes,” McIntyre said, citing the fact that the number of YouTube users outweighs the number of local advertisers on the video sharing site. Innovative technology from video providers is one way McIntyre believes will break down the barrier to increased video adoption. A second issue is building trust between the SMB and video provider. “Innovation must clearly deliver results,” McIntyre said. Backyard launched a free trial of its product to demonstrate its efficacy to customers. “Within eight weeks, it from zero to almost 150,000 in recurring revenue,” McIntyre said. In addition, Backyard saw more than 60 percent of free trials convert to paid customers. Perform’s managing director, Juan Delgado, seems to have found the sweet spot. His company combines sports video highlights and YouTube’s audience reach. Perform syndicates national sports content across 250 publishers nationwide. “We have the ability to access ad budgets that traditionally went to ESPN, and we’re channeling some of that to online video,” Delgado said. By getting professional sports leagues to license their sports highlights, Perform is able to syndicate the content at no cost to the publisher while it retains ad sales rights. In addition to the suggestions of our panelists, we’ll be reporting on additional technological innovations and case studies that advance the power of video for SMBs. I help local SMB grab online attention and leads via top traffic websites. I’ve been watching a few videos I’ve done for clients climb to the top of Google when local search terms are included. I’m curious to learn more about the approach John McIntyre used. I mean $150,000 in recurring revenue using free trials is impressive. What is the innovative technology he is using? on the deep research and development, to more and more accurate, more and more high-tech and multifunctional direction.